You are here: Home / Pain / Why Love? This was written for a friend I lost this year. She will probably never read this post but as it was formulating in my mind I felt the Lord showing me this wasn’t just for her. 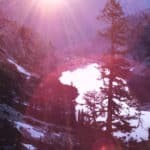 I know we’re not the only ones, I know there are other broken hearts and broken friendships out there—this post is for all of us. I also feel like this post carries spiritual power and in some way—that only the Lord knows—will help bind the enemy in the spirit. Exposing his schemes and his darkness always shines light on his ugly plans, which helps take away his power. If there’s one thing I want to do in this life it’s to take as much power away from the enemy as I possibly can so that people can see who God really is, and how much He truly loves them. So here we go… To my friend who will probably never read this. As I’ve thought about this for the last few months I feel like my heart breaks more and more, rather than beginning to heal. As I was thinking about our situation today I was reminded of my high school boyfriend, the guy I thought I’d be with forever. We graduated high school together, went to the same college, it was perfect, and then our relationship began to fall apart. Months after we broke up I was talking with his mom and she said something to me I’ll never forget, she said, “You could never see how much he really actually loved you.” And she was right, I couldn’t, and I didn’t, for years. I couldn’t see how much he loved me because I was blinded by the enemy who masked himself behind my insecurity, control, self hatred, and countless other things. And that is what the enemy is doing, he’s stealing your joy, he’s stealing our family, he’s stealing everything we’ve built and he’s replacing them with lies. He doesn’t just want to steal away what we had, he actually wants to “slaughter” the memories so there’s no joy left to look back on. “Life in it’s fullness until [we] overflow!” But that’s not what we’re both feeling. I don’t know what you’re feeling—all I know are some of the things you’re saying about me behind my back—but I know I’m not overflowing with life. I’m overflowing with sadness. A sadness and a brokenness so deep it feels like I’m actually mourning the death of my very own sister. And this sadness makes me angry, not at you, but at the enemy! I’ve actually been asking the Lord to give me a way to take the power of the lies, the enemy is using against me, away from him. Not because I care about my reputation, but because I care about you. I hate that the enemy is lying to you and he’s using me as the ammo! It’s not a power I gave him permission to use and I want to know how to take it away from him! I understand you don’t want to be my friend anymore, I’m not trying to fight to get you back, I’m fighting because I want you to be free. Don’t get me wrong I would love to be your friend again, someday, but I also love you and don’t want you to have to do anything you don’t want to do, even if that means being friends with me. And I think this is why my heart hasn’t started to heal yet, because you’re not free, you’re hurting, and that hurts me. I know you’re mad, and telling people I made you be someone you never wanted to be, but I want you to know that is a lie. More than anything all I’ve ever wanted was for you to know who you were in the Lord. I wanted you to know how to receive a compliment and not give 100 reasons why the compliment wasn’t true. I wanted you to really believe the beautiful things everyone says about you because you really, truly are a beautiful person. I wanted you to believe in yourself the way I did and stand up for yourself when you were wronged, which is why I fought for you so many times. And now the enemy is taking all of those things and telling you my intentions were the opposite of what they really were. He is stealing the truth and replacing it with a more convenient truth that validates your reasons for not wanting to be around me. It breaks my heart because I feel like it’s as if the enemy is taking all the love I ever had toward you and using it against me as ammo, at you. It really is a brilliant plan. And it’s breaking my heart. I think it’s breaking both of our hearts. But it’s not just me and it won’t end with me. He’s a pro, we are not his first victims, and we won’t be the last. There are so many people in this world whose hearts are breaking and who feel truly alone because the enemy is horrible, he hates us all and he won’t rest until he has completely destroyed us. It will look different for everyone, but in our case he’s going to have a lot of work to do because I’m not done fighting. I’m not giving up. Love is a funny thing, it sounds like it would be an easy command but this year I’ve learned, from the person who vowed to love me forever, that sometimes love can hurt so badly. Sometime people make poor choices and sometimes your love for that person can physically make your heart hurt because they didn’t love you well. 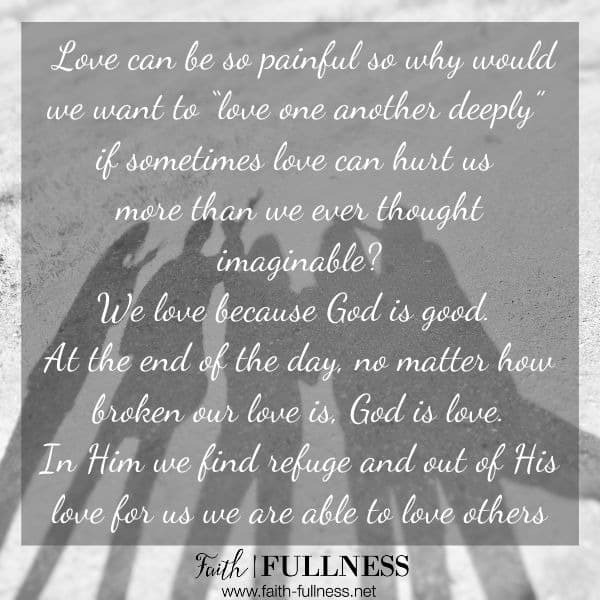 So why would we want to “love one another deeply” if sometimes love can hurt us more than we ever thought imaginable? At the end of the day, no matter how broken our love is, God is love. In His love we find refuge and out of the overflow of His love for us, we are able to love others (1 John 4). I am a very broken person, I’m a work in progress. I’ve learned a lot the past couple months and I’ve learned that everything you know can be turned upside down in an instant. And in my brokenness I’m learning that I need the Lord more than I thought I did, more than I ever knew I could. And I truly apologize if, in my brokenness, I have hurt you. All I ever wanted to do was love you and all I’ve ever wanted from you is for you to know how deeply Father God loves you. But somewhere along the way I failed you and I’m sorry, truly sorry. I pray that in your life you will experience the abundance of the Father’s love. 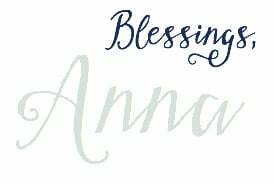 I pray His blessings in your life will be so abundant they will blow your mind. I pray you will experience His fullness more than ever before. I pray you will feel His peace in ways you would never expect. I pray the enemy’s screaming whispers will fall on deaf ears and the Lord’s truth about who you are will be the only thing you ever hear. I pray you will know His love and feel Him loving you through the other friends in your life, and from your spouse. Blessings my friend, I will never stop loving you and I will never stop praying for you because you are worth it, and you deserve to know that someone is always fighting for you, always on your side. WOW! I will join that pray as well. May Holy Spirit fill her heart with the knowledge of the Father’s love so much that her eyes will be opened to truth.